Linda's Dream Garden: Little visitor. 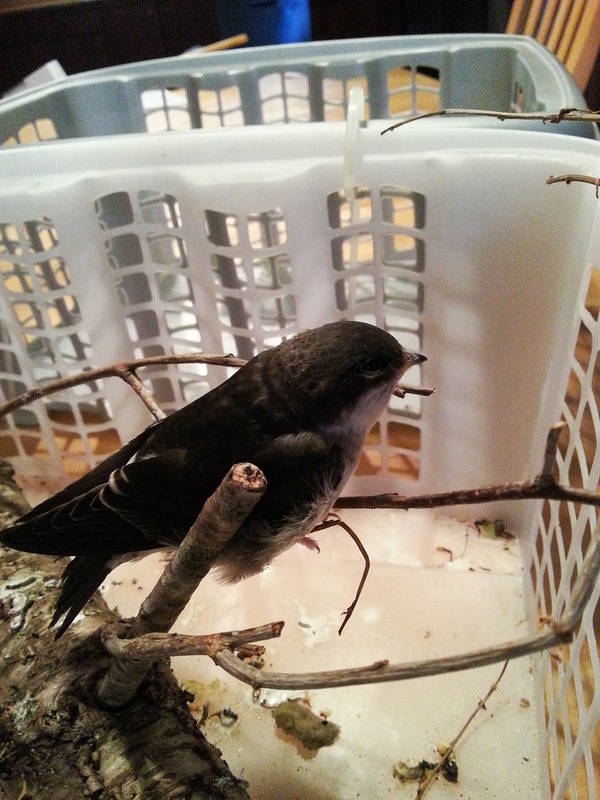 Sunday we found this little bird on the ground in Hals. His nest had fallen off of the wall and he was just siting there on the ground. He was very tame I put him up in a near buy plant and waited. After 4 hours he was still there and very hungry. We feed him some bugs, but he wasn't inclined to fly off. I could tell he was a juvenile common house martin he still had some of his baby fluff and not all of his feathers where out yet. I decided to bring him home with me. His nest was on the ground there was no sign of mom. There wasn't much else I could do. Saturday and Sunday we feed him up on crickets and bugs. He wasn't interested in eating the caned dog food I normally feed baby birds. Unless of course I added some legs and things to the food then he would eat it. Silly bird, it must be bugs. It's a good thing the local pet store sells live crickets he loved those. 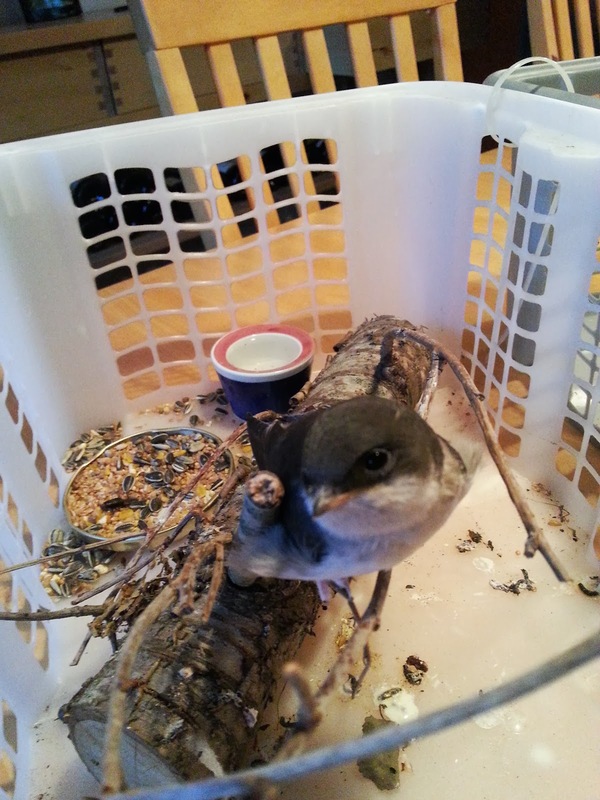 He was very lively and started flying around on Sunday he kept going to the window so I knew he wanted to go out. This morning before work I feed him as many bugs as he would take then I put the cage out on the porch. He can fly off now and start to find his own bugs. My garden is surrounded for the most part by high trees and there are no cats in the area. I'm hoping he wont go far as he learns to fly and hunt for himself. When I get home if I can find him I will feed him a few more crickets. There is a little flock of house martins not far from where I live hope he will go find them in the next few days. They tend to like to live in flocks so he needs friends. Update: Little bird was gone when I got home last night. He must be able to fly well because my garden is surrounded by high trees and a hedge that is about 2 meters high. 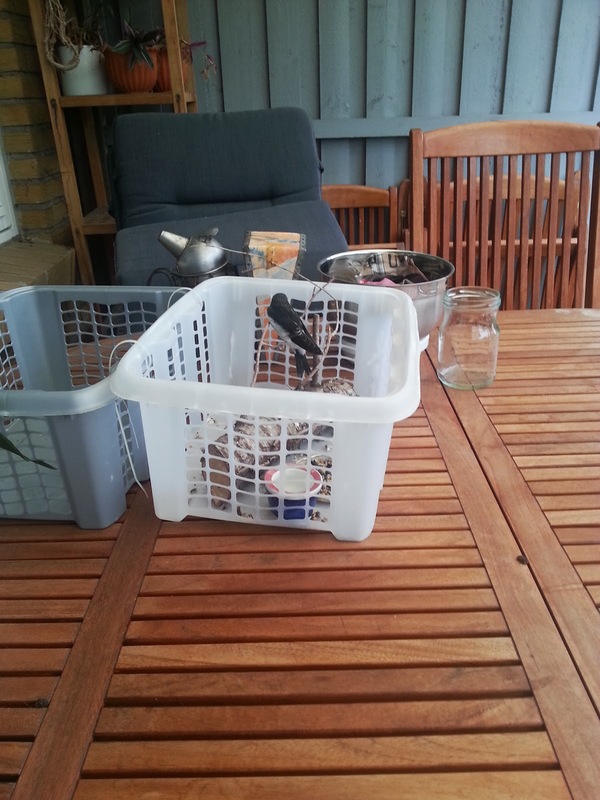 I couldn't find him, I left his little cage on the table. I hope he has luck finding his own bugs.